In January 1799 the 61st (South Gloucestershire) Regiment landed at the Cape of Good Hope. The British military presence was required to forestall any French attempt to annex the Dutch colony and to safeguard the passage to India. The 61st were actively engaged in subduing both Boer rebellion and fighting the local Kaffirs. One memorable day’s march saw the 61st’s Light Company hurry some forty miles in support of a detachment of the 8th Light Dragoons against the Kaffirs; on another occasion soldiers of the 61st were manning the shore batteries which were engaged firing in support of the sloop, HMS RATTLESNAKE, against a 40-gun French frigate, LE PRENEUSE. The 61st were also called upon to protect friendly Boers from Kaffir raids, and part of the strategy to deal with them was to build chains of blockhouses, a task that would have seemed very familiar to their descendants a hundred years later during the Second Boer War. Indeed, dealing with raiding Kaffirs was the first operation undertaken by the 61st after coming ashore. “About a week after we landed the government received intelligence that the Kaffirs were killing Dutch Boers. 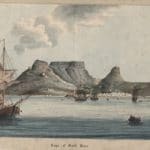 The Corps to which I belonged was ordered to embark on the PHOEBE, frigate, and the wind being fair we soon reached Algoa Bay. Sergeant Andrew Pearson of the 61st. Back in England, the Experimental Corps of Riflemen was being formed and Ezekiel Baker was manufacturing his famous rifle, destined to equip the 95th and other corps on the battlefields of Europe and North America. South Africa was not forgotten either, and in 1801 picked men from the 61st, as well as from the 22nd, 34th, 81st and 91st Foot, and the 8th Light Dragoons, were formed into a rifle company. The men were dressed in rifle green and sent as part of a force under General Vandeleur to subdue rebels at Graaf-Reinet. The rebels surrendered without a shot being fired. Picture: View of Cape Town by William Porter of the 61st. Original in the Soldiers of Gloucestershire Museum.